A Guide to Modern Manhood is the debut publication for Eli Auerbach. Included within is a series of witty proverbs that serve as a primer for all young men as they evolve from childhood to adulthood. Eli honed each lesson over a lifetime of failure, wrong turns, self-defeating behaviors, bad choices, missteps, and foolish decisions. He is widely considered an expert in the field of what-not-to-do-to-be-successful. He is an avid runner, voracious reader, and devoted dad to a precocious ten-year old boy. Eli and his son live in northeast Ohio. Eli Auerbach wanted to teach his son valuable life advice, just like any other father should. However, his curious son would be too inquisitive about where he obtained his knowledge. So Auerbach, in a moment of brilliance, came up with a unique concept - a Dad book that would hold the information a growing boy could ever need. This book would later develop into A Guide to Modern Manhood: Quirky Quotes from a Sarcastic Dad. And the book has everything a young man needs, from dating advice to the do's and don'ts of life. Some are humorous, some are deadly serious. But all are witty and apply to every boy and man in our lives. I am a woman, so maybe I am not the right person to be reviewing A Guide to Modern Manhood. But everything Eli Auerbach discusses and relays in this book is knowledge I would want my son to know and follow by heart. He mentions that a man should reach for the check at dinner but not argue if the woman gets it first. He also goes over advice that I think applies to any gender, such as not to judge people by their cover, not to buy cheap toilet paper, and not to be afraid to ask for help. I think it's obvious anyone could benefit from this short but impactful read. So jump into it by yourself or with your child, and you'll learn a thing or two or twenty. Auerbach's book is one of those large blessings in tiny packages that can really make a difference. 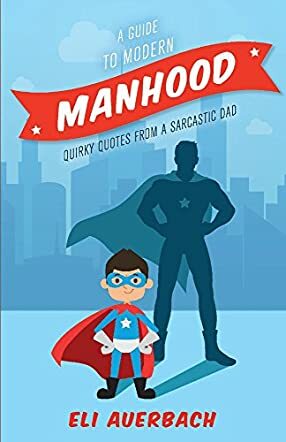 A Guide to Modern Manhood: Quirky Quotes from a Sarcastic Dad is a humorous nonfiction collection of advice and sayings written by Eli Auerbach. This is the author’s first published work, and it is based on his own experiences raising his now ten-year-old son. The idea for this guide had its start in his fatherly duties of fielding the prodigious amount of questions enthusiastically lobbed at him by his son. When his son began to question the sources of his dad’s knowledge, Auerbach glibly answered that he read it in the Daddy Book, which was the font of wisdom all good dads referred to. Inevitably, his son began to ask him what the Daddy Book had to say about things, and Auerbach would pull his Daddy Book, which was a leather-bound Jewish prayer book, off the bookshelf and find the answers. And while Logan did eventually outgrow the Daddy Book, his father continued to think about the font of knowledge each dad needs as his child grows up. Eli Auerbach’s humorous nonfiction collection of paternal wisdom, A Guide to Modern Manhood: Quirky Quotes from a Sarcastic Dad, is a delight to read and goes far beyond the oft-repeated refrain that “do you think money grows on trees?” His sayings are even categorized in entertaining ways, starting with the many “Don’ts”, continuing to the very reasonable and common sense wisdom of “If...Then,” and concluding with the best quote of all which is found on the last lines of the last page. Best of all, you don’t have to be a dad to appreciate the wit and wisdom found within this slim volume that is big on common sense, humor and warmth. A Guide to Modern Manhood: Quirky Quotes from a Sarcastic Dad is most highly recommended. A Guide to Modern Manhood: Quirky Quotes from a Sarcastic Dad by Eli Auerbach are amusing notes and anecdotes written by a father to his son. Each note is intended to impart wisdom in difficult situations, or perhaps in everyday occurrences that need to be thought through before being acted upon. Although written by a father, and entitled a guide to modern manhood, these hilarious sayings can reflect the view of any parent who tries to advise a growing teenager without coming over as overbearing or complacent. From everyday sayings to advice on being a good human, to women and dating, and even to parenting, this laugh out loud book covers it all. Sarcastic Dad Eli Auerbach actually comes over as a really caring parent, albeit with an insanely humorous approach. What better way to get a young person’s attention than to make them laugh, whilst at the same time giving them the benefit of his extensive wisdom. I found myself smiling all the way through, and certainly could relate to much of the advice given. I think the book would really benefit from comedic illustrations, but it works as it is and is definitely fit for purpose. This would be a great gift for any father to give a son. The author, Eli Auerbach, has taken a really difficult subject and turned it into a light-hearted yet serious collection of words of wisdom. Certainly Eli’s son should be proud that his father took so much trouble to impart his life knowledge in such a unique way.